Oh, how wonderful, Misty! What a beautiful couple of shots, and a beautiful couple of birds! Love on a barbed wire fence. Amazing! I'm going to try to find a Camera Critter post for this weekend - just got back from Europe this afternoon, jetlagged but happy to be home with our dog again. I love the Meadowlarks, Misty! 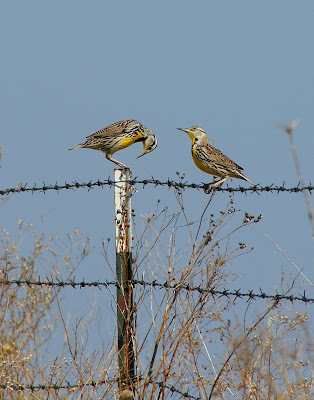 The are beautiful birds, great photos. 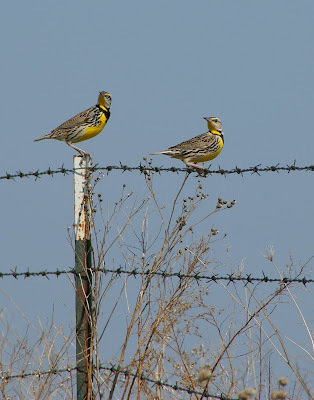 Great shots of these meadowlarks! The lighting is perfect. Tell me, tell me. So did they build a nest together? Lovely captures,and the birds are So beautiful! I really love those shots! Soft colours and great texture. The dialogue is perfect. I swear that guy is proposing—something. Very nice shots! Would you come and see my critters? Thank you! Your always tickle me with your commentary - great sense of humor.